Colored marbles fall from the middle platform in sets of three, into an open box. Move left: Press left side of screen. Move right: Press right side of screen. Rotate left: Press bottom-left corner of screen. Rotate right: Press bottom-right corner of screen. Move down: Press bottom-center of screen. Pause the game: Press the score board. 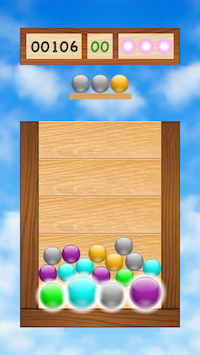 Connect four or more marbles of the same color to break them. 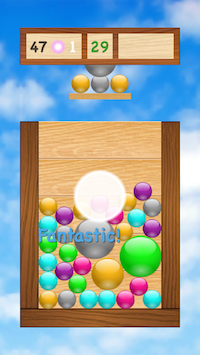 Score big combos by connecting more than four marbles of the same color, or by breaking multiple groups of marbles in one shot (including chain-reactions). 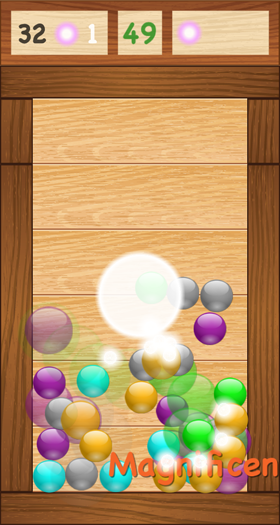 A combo of five or more will generate a "spirit bomb" (white), which will be used to destroy "dark spirits" (black) that emerge throughout the game. The higher the combo, the bigger the spirit bomb! If a dark spirit is not destroyed in time, it will summon a random-colored marble that falls from the sky - the size of this marble is proportional to the size of the dark spirit, which progressively becomes bigger as the game goes on. A big marble will shrink into a smaller marble when it breaks. If any marble spills out of the box, the game is over! Occasionally, a marble will have a white glow around it. 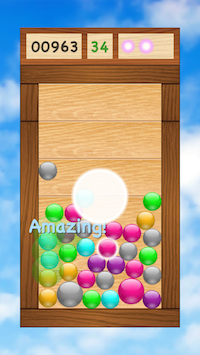 Breaking a glowing marble will release a "fairy" (pink), which can be used to shake up the marbles in the box! In arcade mode, the left section of the score board shows the total score. The middle section of the score board shows the combo count. The right section of the score board shows the number of fairies available for use. Free all the fairies in the box before the marbles run out. Use Game Center's match-making capabilities to go head-to-head against your friend or random players across the world! Simply press the "Online" button to start a match. Connecting with nearby players via WIFI or Bluetooth is also supported. In online mode, there are no dark spirits. 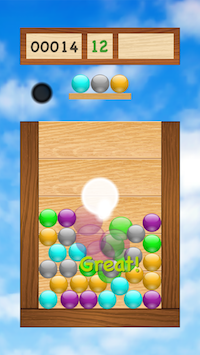 Instead, the spirit bomb you create will be sent directly to your opponent's screen as a random-colored marble! The size of this marble is proportional to the size of the spirit bomb. Needless to say, the bigger the spirit bomb you send, the more devastating it will be for your opponent! The background music can be turned off from the options menu. The white-tinted control "guide" can be turned off from the options menu. Turning the guide off is recommended for experienced players and for the best visual experience. 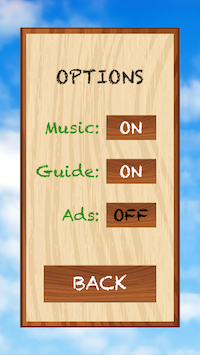 Advertisements can be turned off via the "Remove Ads" in-app-purchase by clicking on the "Ads" on/off button inside the options menu.